"Duster bug" is a cute litte 5 months old Dusty Conure or Weddell's Conure... and a real character! Dusky Conures are very popular pets because of their quiet, friendly, and easy going disposition. "Duster Bug" was handfed and likes the company of people very much. He loves to be held and played with. He has proven to be a very good escape artist. He climbs out of his own cage and climbs in other cages to visit his friends! Although "Duster Bug" doesn't talk yet, most Dusky Conures will learn to say a few words. Originates from western South America. They populate water courses in the Amazon basin and the tropical woodlands on the eastern edge of the Andes mountains. Also known as the Weddell's Conure, the Dusky Conure belongs to the parrot family. It has a green body and a gray-brown head. The tips of the feathers on the top of the head have a bluish cast, the legs are gray. They grow to about 11 inches. Younger birds are duller in color and their belly is green turning more yellow as they age. The ends of the primaries and tail feathers are blue. Mature birds are about 11 inches long and weigh 4.1 ounces. The Dusky's main diet should primarily be nuts, seeds, fruits, and vegetables. A commercially prepared pelleted diet can also be beneficial. Wild conures are friendly and peaceful. They live together in groups of 20 or more birds and seldom fight with each other. Dusky conures breed early in the year. They lay three to four eggs which are incubated for 24 days. Once hatched the young will stay in the nest for about 55 days. Many females will only take an egg food while they have young in the nest. This bird is not nearly as noisy as most Aratinga species. I know this was over a year ago but I have a male dusky if you are still interested. I just rescued a Dusky Conure, she is feisty especially with her mate. When I hand feed her she loves the one on one. I named her Ally, I am not certain as to her living condition or age prior to rescuing her and her mate which I call Noah. They love and fight like crazy.. But how they make up and kiss one another is priceless. I am learning more and more each day. And desperately trying to win there affection.. Any ideas please share. I feed them apples and millet and they seem to really enjoy those treats. I would like to know what other foods they eat, please feel free to post any suggestions. I am new to the world of conures. My husband and I have a dusky, his name is Bubba he's a year old. These guys love to eat what we eat, pizza, bacon and eggs mashed potatoes and gravy, all nut, fruits veggies. NO avocado or chocolate this will kill him. NO avocado or chocolate. Go online or to a bird farm to learn more. Broccoli, carrots, zucchini, dandelion leaves, fresh spinach, rice, pasta, eggs, couscous, chicken, asparagus, green beans, corn, yellow/green/red peppers, cantaloupe, honeydew melon, grapes, almonds, sprouts, are what my Charli eats, on top of a small amount of yogurt in the morning with a piece of toast. And a good quality grain. Charli, 6 years old Dusky conure. The bird farm where I bought my Dusky conure at, suggests that some of the foods be; peas, pomegranate, yams, broccoli, greens, whole grain rice, pasta, a tiny bit of diary products, etc. Basically, they can eat almost any thing you eat, but never feed it avocado, as it is toxic to them. Hope that gives you some idea. We have 2 Conures - a Sun & a Dusky. Their FAVORITE food is BIRD BREAD! You can find the recipe on the Alaska Bird Club website - I highly recommend it. They also really like red grapes cut in half. Pet Smart carries a lot of good dry food with sunflower seeds in it. Try putting a coat on & tucking them in the coat at your shoulders - they love to snuggle up like the warmth & mine go to sleep there at night. We got tiny white dog beds at Walmart which they sleep in at night with a light weight blanket over it to keep it dark. ENJOY! Ours have been a whole new world to us. 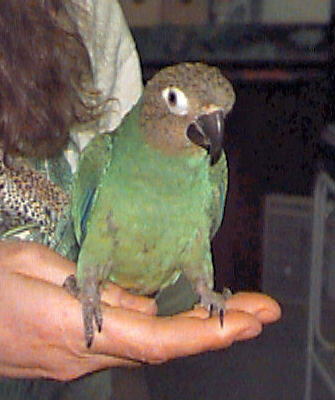 We had our dusky conure for seven years before discovering he was a she - an egg. She is a VIP in our household but when we were out at work she was lonely and we were guilt ridden. We'd researched for years, introducing a companion but advice was mostly negative, even from a local bird sanctuary. 7 years later we adopted an unwanted male dusky conure, 5 years old. They were kept in separate cages, next to each other and had limited contact for 4 months, they tolerated each other you could say. Suddenly they clicked one day. They are so happy. Seeing them now confirms how important it is for birds to have a companion. We went with our instincts and thankfully it was right to do so. I have a dusky conure and we named him coach, he goes by mini coach. We also have a great dog who gets along with mini coach. My husband I love our animals very much and we are dedicated to keep them healthy and go to our trip to our vet annually. Unless, there is something wrong or we notice a change in their behaviour. That being said, we took mini coach to his annual visit. It's been two days since we took him and we notice a big dramatic change in our mini coach :(. He was fluffy and standing on one leg, the same leg. However, he does eat whatever we give him. But he still stands and he has been standing on that one leg. Here and there he'll walk. But he was talking very much today :(. We called the vet and they asked when we came in for the visit, if mini coach got his nails trimmed? And he did..and I did notice that the doctor trimmed his nail a little short that it started to bleed. All I'm hoping for tomorrow is when I wake him up he'll be back to himself if not I am considering to take him back for another check up.